While watching the old Gary Cooper movie “Mr. Deeds Goes to Town” I fell absolutely in love with windows in the background of the courtroom scene. 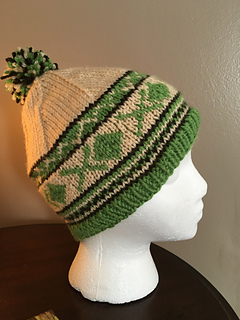 Using them as my inspiration, I created this hat, which I now plan to use to teach the stranded Fair Isle knitting technique. 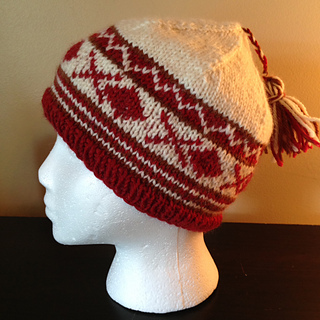 Knit in the round on circular and double-pointed needles, this hat is a great beginner project for stranded Fair Isle. Finished size is approximately 19 inches circumference. Fits easily on average sized adult head (22”). 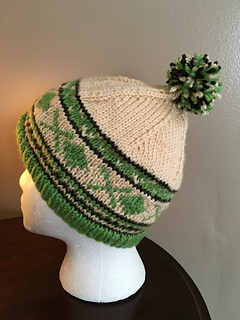 Uses less than a full skein of each of the 3 colors of Wool of the Andes yarn, which is about 110 yards per skein.